In the 19th century and even later, there was no shortage of people eager to watch the unwrapping of an Egyptian mummy. 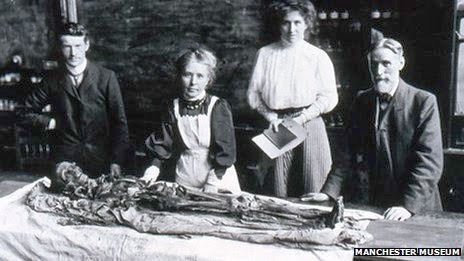 In 1908 in Manchester, some 500 people gathered in a lecture theatre to see prominent Egyptologist Margaret Murray supervise the unwrapping of a body from the Tomb of the Two Brothers from Manchester Museum's mummy collection. As Egyptology and archaeology evolved, the destructive practise came to an end, but it didn't mean researchers and the public were any less curious about what lies within a mummy. Now 21st Century technology is being used to virtually unwrap mummies without causing any damage to the body and wrappings. 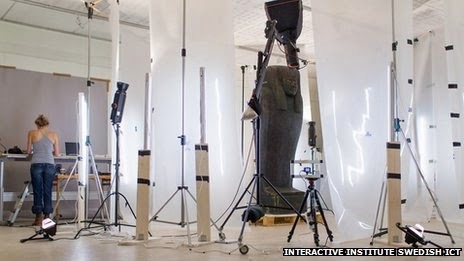 Museums around the world, including the very same Manchester Museum, have been sending their mummies to hospitals to undergo computed tomography (CT) scanning, creating density maps of their insides for researchers to analyse. And now comes a chance for the public to digitally unwrap a mummified body themselves. Stockholm's Medelhavsmuseet, the Museum of Mediterranean and Near Eastern Antiquities, has been working with the research group Interactive Institute Swedish ICT to digitally scan their eight human mummies as part of preparations for a new permanent exhibition. The results for one of their mummies, the Egyptian priest Neswaiu, are now on show in the form of a digital autopsy table in an "embalmment room" beside his real mummified remains and coffins. Using the table, visitors can virtually open the two coffins and then unpeel each layer of the mummy from his highly decorated cartonnage (the mummy's outer layer) down to his skeleton. They can also cut a cross-section through the multiple layers of the coffins and body. 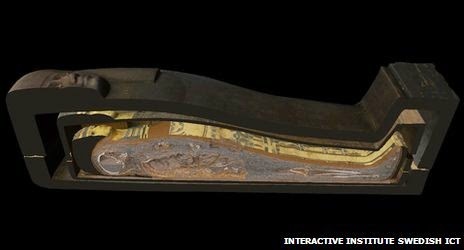 Sofia Häggman, museum curator, told the BBC she wanted users to be able to "see this information first hand" and not always have to count on researchers explaining what can be found on this mummy. "Now you can simply unwrap it virtually yourself," she said. The autopsy table uses software called Inside Explorer developed by the Interactive Institute Swedish ICT. The group first developed the platform for use in hospitals and by medical students but they've since gone on to work with the British Museum on a virtual autopsy table for the museum's Gebelein Man, a naturally mummified Egyptian man some 5,500 years old. They've also worked with London's Natural History Museum, the Smithsonian in Washington and the Field Museum of Natural History in Chicago. The Interactive Institute Swedish ICT say the Neswaiu project represents their most advanced work yet, combining data from both CT scanning and photogrammetry, by which 2D pictures of the coffins and mummy were taken from multiple angles to build an accurate 3D surface model using Autodesk's Recap Photo software. Neswaiu lived in the third century BC at the temple of the god Montu in Thebes - modern-day Luxor. His remains were gifted to the Medelhavsmuseet in 1928 when it first opened. "We know that his mother's name was Takerheb and we also know that he belonged to the upper classes of Egyptian society because he could afford an expensive mummification. Not everybody could," said Sofia Häggman. "He also has a gilded cartonnage, he has two coffins and he has a lot of amulets on his mummy, small pieces of jewellery that would aid him into eternal life." 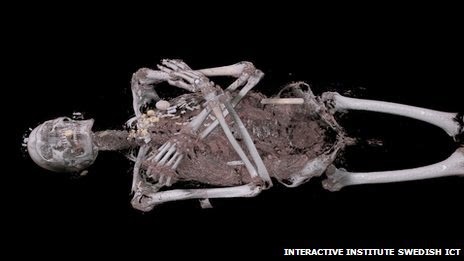 Researchers have tried to see what was inside his mummy before. His stomach was opened in 1962 and a tissue sample removed and X-rays have also been taken previously. But the digital autopsy has added much more detail to their understanding. "He was healthy, pretty muscular apparently. He lived until he was 50 or 60 years old which was comparatively old in ancient Egypt and he might have died from an infection in one of his teeth which affected the bone and could have caused blood poisoning," said Ms Häggman. The scanning process has also given them further insight into the mummification process. "You can see the cut where the internal organs were taken out. You can see the wrapped packages of intestines, of the lungs and the liver they put back inside the body and you can see how the cut was then resealed and they put an amulet in the shape of the embalmer's two fingers across the cut to protect it." Scanning also pinpointed in three dimensions where 120 amulets found on his body were placed, including a falcon-shaped one. The data was used to 3D print a mould and then cast an exact replica of the falcon while leaving the original undisturbed on the mummy. What Neswaiu doesn't have any more is a brain - that was not preserved. Humans, the Egyptians believed, thought with their hearts.